Zimbabweans reacted with surprise yesterday, to Thursday’s announcement by the inquiry looking into the August 1 shootings in Harare, that it had already handed over the executive summary of its report to President Emmerson Mnangagwa. The commission’s unexpected announcement came a few days after it ended its public hearings into the post-election shootings which left at least six civilians dead when the army joined police to quell disturbances in the capital’s central business district. The probe is headed by former South African president Kgalema Motlanthe — with the other members of the inquiry being academics Lovemore Madhuku and Charity Manyeruke, Law Society of Zimbabwe (LSZ) ex-president Vimbai Nyemba, Rodney Dixon of the United Kingdom, former Tanzanian chief of the defence forces General Davis Mwamunyange and ex-Commonwealth secretary-general Chief Emeka Anyaoku of Nigeria. Political analysts who spoke to the Daily News yesterday said the submission of the inquiry’s executive summary to Mnangagwa “raised eyebrows” — as it painted a picture of a report “hurriedly” done despite the lengthy time it had taken the commission to gather evidence and testimonies. “The haste with which this report is being pushed through and the evidence analysed for a final report ahead of a very tight timeline raises a number of concerns about both the process and the product that the commission is producing. “It’s all highly problematic. The commission, as far as I am concerned, had up to the middle of December to complete its report. We saw it this week refusing to take evidence of individuals appearing before it because the cut-off date had already been reached. “As far as I am concerned ... it also appears as if there is a lot of evidence that has not been looked at,” Piers Pigou, a senior consultant at the Crisis International Group, said. “It is also not clear why Mnangagwa and (deputy president Constantino) Chiwenga have not been called to clarify the contradicting versions given by (the commander of the defence forces Philip Valerio) Sibanda and (former Home Affairs minister Obert) Mpofu in terms of the chain of command on the deployment of soldiers on August 1. “We also saw no independent investigating capacity of the commission to check, verify or corroborate aspects of the testimonies put in front of it. “Let’s see what the final report says … then we can assess the findings and recommendations of the commission,” Pigou added. “But I have to say, so far it does not fill me with comfort that the process is really going to get to grips with what actually happened that day,” he said further. But University of Zimbabwe political science lecturer, Eldred Masunungure, said while the commission of inquiry appeared to have rushed its job, there were many ways of presenting and compiling reports. “There are different ways of killing a cat ... In some cases some wait until they have collected all the evidence and then they start preparing the report. Others prefer compiling the report while collecting evidence. “I suspect in this case that that’s what they did. Clearly they did their work early. But those who are querying the time within which this has been completed are also justified. “It did raise eyebrows. Under normal circumstances, it would take a week or two after the final testimony to complete a report,” Masunungure told the Daily News. Veteran broadcaster and spokesperson for the killings inquiry, John Masuku, said the probe’s commissioners had simultaneously collected evidence while compiling skeletal reports — hence the speedy release of the executive summary of the report. “What was presented was just the executive summary. The actual report is being bound and sealed. Don’t forget they had 90 days to do their work … they started working flat out early. “Everyday after the hearings they compiled a skeleton report. Towards the end, they had been working 24 hours a day to make sure they completed the task early. “They were very systematic, which is what assisted them to finish their work early. As I said, they had 90 days which lapse on December 19,” the affable Masuku said. “They have done some work, but I don’t believe they were thorough. The commission did not also interview a number of victims. “The commissioners should have saved their integrity by spending time looking at the evidence. There are a lot of gaps ... people have been left with a lot of questions. “There are questions about the integrity of the information that the commission was getting and why they left out a number of victims and their relatives,” Okay Machisa, the executive director of the Zimbabwe Human Rights Association (ZimRights), said. “At the press conference hosted by the Human Rights NGO forum, it was raised that there are worries about certain evidence that has not been considered by the commission. “We are not sure if the commission used or received the information that it obtained from the Human Rights NGO forum,” he added. Things at the shootings commission of inquiry got heated in the last few weeks, after security chiefs testified and wholly absolved the military of the killings in the process — while the opposition, which it had appeared to blame for the shootings, maintained that its hands were clean. Relatives of deceased victims gave gripping accounts of how their beloved ones had died during the deadly violence of August 1, which followed the peaceful July 30 elections. The shootings occurred after millions of Zimbabweans had cast their votes in the polls to choose both a new Parliament and president — following the dramatic fall from power of former president Robert Mugabe last November. 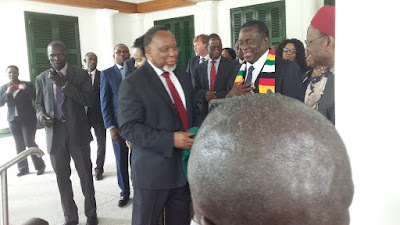 Political analysts have also said the August 1 violence and the resultant deaths had done a lot of harm to Mnangagwa’s quests to mend years of frosty relations with Western governments.